The only disadvantage for a gardener that I can see of using winter rye for a cover crop is if they don’t know anything about it and therefore don’t plan to work with the characteristics of winter rye. If you know how it grows and how to use it — it’s one of the best cover crops to plant. It likes cool weather — so the fall is the obvious time to plant. 1. Will germinate even at temperatures as low as 34 degrees. That means you can plant late in the season and still get decent growth established to cover the ground before winter really sets in. September or October are great times to plant. Here in Virginia, we could plant into November and sometimes December — although that might be pushing it a bit. 3. Cover crops in general are the best way to add biomass to the soil. (Especially if you don’t have access to good animal manure.) . Rye makes a lot of biomass which is important when you consider organic materials for mulch and/or to incorporate in the soil are always in demand. 5. Scavenges excess Nitrogen and holds it until its biomass decays the following late spring/summer. Decide where you’ll transplant seedlings like tomatoes, cucumber, eggplants, and squash next year. Plant those beds generously with winter rye now. Although the seed will germinate in temperatures as low as 34 degrees — its best to get it planted as soon as you can so it can put on good growth before winter. The plants will go dormant and stop growing at temperatures below 38 degrees, so get it in as soon as you can this month. It will resume quick growth next spring. Pollen on winter rye in May look like little yellow flags on the seed head. 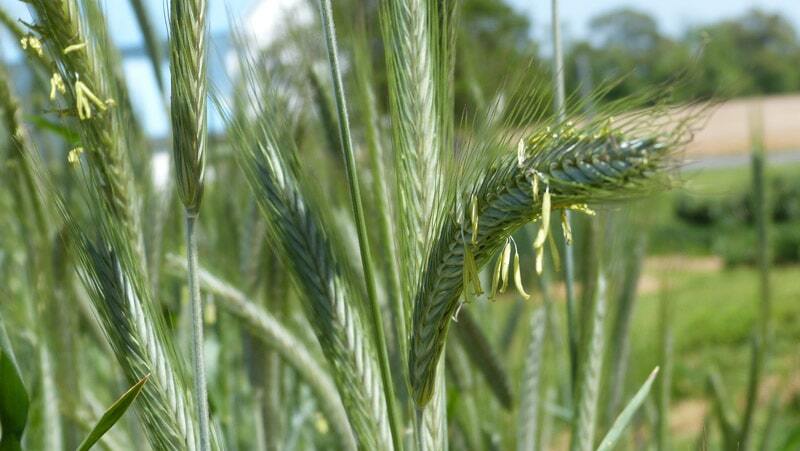 Pollen hanging on winter rye about May 11. The stubble itself will mulch the bed, but I like to leave the biomass right on top of the rye stubble for deeper mulch. Also when the vegetation breaks down — all the nitrogen (or any other nutrients it has gathered from the soil) will be released for use by the plants that come next. A week before you want to transplant your warm weather seedlings (tomatoes, eggplants, peppers, squash), use a hand mattox to dig a hole into the rye stubble. (In my sandy soil — with one blow of the mattox I can just pull up a chunk of stubble about 6 to 12 inches in circumference.) I loosen the soil in the hole and then plant the seedling. Just to compensate (in case the roots are tying up some of the nitrogen in the soil as they decay) add a cup of so of compost on top of soil around the seedling and top that off with some mulch like straw or even the biomass from the rye. Later in the summer the roots will have decayed and that nitrogen released will then be available to your vegetable crop. By mid to late summer your mulch (the biomass from the rye) may be just about gone. Add more mulch after a nice rain. I’m in the process of preparing a new bed for vegetables outside the fenced garden area. The weeds and wire grass are being removed but I’ll not have time to deeply prepare the bed this season. I still want to plant butternut squash there next year. 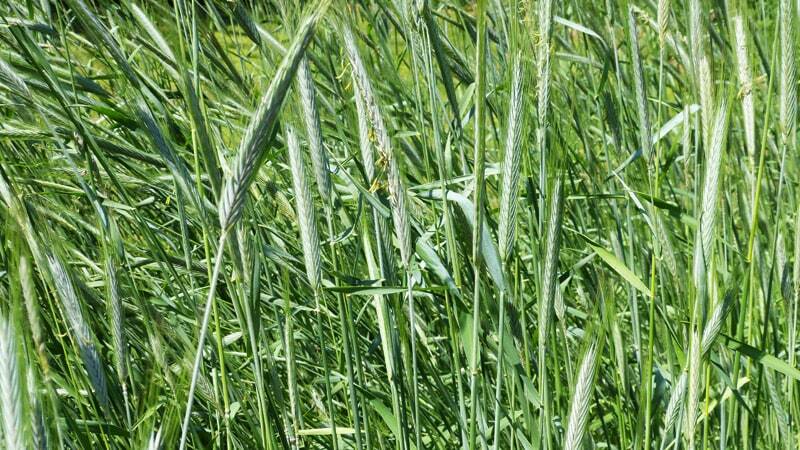 Winter rye is an excellent choice on infertile, sandy, acidic, or poorly prepared land. Three of the four adjectives describe my new spot: infertile, sandy, and poorly prepared..
I’ll plant the area with winter rye this month. As the roots decay in late summer I may plant buckwheat along with the squash to cover the ground. When the squash are finished next fall I’ll prepare the soil deeply and cover with straw if there is no time for another cover crop. I’ll put tomatoes in the following year and underplant with a cover crop like clover. These are excellent strategies for using Winter Rye to benefit your beds during the winter and benefit your warm weather crops the following season. It covers and holds the soil for winter. The stubble provides a mulch through the Spring and most of the Summer. The top growth and the roots hold the moisture of snow and rain for use in the future. Provides a lot of biomass which can double as mulch. If you want to plant early spring crops, you’re better off using a different cover crop that would winter kill and decay by spring, allowing you to plant earlier in the spring. But for warm weather crops that you’ll plant in late April, May or June next year — you can’t beat Winter Rye for a cover crop this fall. A step I hope you will take Sandra. Diversity is important in cover crops as well as everything else. And yes — we have plenty of time to implement plans with winter rye. Sure glad we live in this relatively mild area. Thanks for taking time to comment Jack. Glad to have you reading. Thanks for being such a source of organic information. BTW I ordered some of that Escargo and it works very well for the slugs and snails that liked my mulch so well and were eating my cabbage and collards. Thanks for that information too! That’s an interesting combination that you’ve used and it pretty much covers all bases. I would not have thought of this mixture and I think it was a stroke of genius on your part for coming up with it. What I don’t understand is why you would want to sow the rye into it? What is your purpose in that? As far as I can tell there would be no advantage to it. Also — taking up this wonderful organic material that you have up 4 or 5 inches and moving it some place else would only help the bed that you used it on. If you move it now — you would not give it the opportunity to recycle nutrients and improve the soil in the bed in which it is growing. And by the way one IMPORTANT point: — rye grass is different than Winter Rye. You could have some problems with rye grass. From what I understand — it is not what you want to use as a cover crop. You want to use winter rye. I am NOT speaking from experience on the rye “grass” — but I would be very careful about using it nonetheless. At the very least I would use it in a small space for a year to see exactly what it does. I would not use it on a large scale unless you really know what you are doing. I’m glad the Escargo worked well for you and appreciate your mentioning it. That will help others as well. Let me know what you decide. As I said — I really like what you are doing. Keep up the excellent work girl! PS – I forgot to directly answer your question about sowing rye over the 4 to 5 inch growth of other covers Cynthia: Some of the seed might germinate. But since it needs to have seed to soil contact and moisture to germinate well — you’d probably loose a lot. Winter rye is usually best when its broadcast on bare soils. After broadcasting I cover mine with a bit a soil and mulch. That holds moisture and keeps the birds from getting most of it. Great information. Would you please tell me where you get your rye seed? Thank you. Sue, I usually get what I can from Pinetree Garden Seeds because their prices are pretty good and their shipping is very reasonable. Here’s the link for their cover crops https://www.superseeds.com/products.php?cat=139 Just click on the Winter rye to see your size options for seed. I’m happy to say — I was able to save enough seed from some of the rye to supply my needs for this falls winter rye seed. So did not need to buy Winter Rye this time around. Thanks for all the information! I meant the cereal rye…not rye grass. I have grown the cereal (winter) rye before in combination with red clover. That was the year before last. It was so pretty. And I made a mistake of letting it get way to big. It was a huge chore cutting it down. But also that was before I knew about you and your way of doing things. I was trying to dig all this stuff into the ground and so I had lots of trouble with the roots and swore off winter rye. Now I know better because of reading your blog. Anyway, I was just thinking that the winter rye might be a better cover for when it gets cold enough to kill the mix I have on there now. But I shall just leave it all alone and let it die back remain on the ground until the spring. Thanks for the tip about the daikon radishes! And the reason they are in the mix is because I had bought a bunch of seed to plant some greens for my laying hens. I just decided on a whim to throw them in with the iron clay peas and buckwheat to see how they did. Thanks for posting this Cynthia. I think it can help a lot of people. In my region most organic gardeners like to sow winter rye between September and December. I’ve told my neighbors about your strategy for using winter rye stubble to grow warm weather vegetables. Many of them want to try it out this year, and we’ll report at the end of the growing season. In comparison to Tidewater Virginia we’ve had a mild winter and very early spring, so that our winter rye is ready to flower shortly after Easter. We are quite looking forward to our experiment with your strategy. Thanks so much for your good ideas! Millard, Glad that your neighbors found my strategy worthy of a try. I was very pleased with the results and am doing it again this year. Also, if I can ever get enough uninterrupted time to finish it, I have a post on cover crops and diversity that I hope will be very encouraging and helpful to many. Thanks for helping to spread the word. Great that it was well received. Hello Theresa! I planted winter rye for the first time last fall and am wondering if I ought to cut it down now so that I can put my transplants in a couple of weeks from now. I’ve been getting the impression it is supposed to flower first? Mine still just looks like very tall grass (about 3 feet tall) – no flowers in sight. So I’m not sure whether I’m supposed to wait and just pot up my transplants? Congrats on getting that rye planted last fall! The heads should be forming about now and the pollen will follow that. There is really no right or wrong time to cut HOWEVER there is a way that is considered ideal and that is to cut it when you see the pollen on the seeds heads. The reason this is done is because after the pollen forms the rye won’t grow anymore after it’s cut. I guess that may be a problem for those who have large plantings of rye but in my small (by comparison) beds it would not be a problem. I have 3 beds with rye and I will cut at least one of them probably before the pollen forms because I am anxious to get it done. If it continues to grow I’ll just cut it again. Pollen will be readily visible when it forms, since rye produces a lot of pollen. Another thing I might do on at least one of the beds is to cut my “planting holes” now and plant my seedlings. Then let the pollen come and finish cutting the rye and use it as mulch. Thanks Theresa. Your idea of just cutting the planting holes for now then cutting down the rest after the pollen forms is a great idea, since as of now there is no indication of heads beginning to form. Cutting some now and some later is also intriguing – if the ones I cut now keep growing might there be the benefit of those roots having the opportunity to keep penetrating the super-hard sandy soil beneath the 24″ double dug beds? I wonder how deep they could go – that could benefit the vegetable crops in future years. I also have several other bags of cover crop seeds that I bought last fall and per your other recent post I wonder if I cut some of the rye down now, if I could overseed some of the others in to increase diversity even more in those beds. I have yellow blossom clover, oats, field peas, and buckwheat. I’m not sure what combination would be best though – what do you think? As usual, thanks so much for sharing your knowledge! You’ve got an excellent selection of cover crops to start with. Yellow blossom clover penetrates the soil very deeply. When planted early enough in the spring (mid April to now) it should tolerate drought pretty well also. I enjoy planting field peas and oats together. Buckwheat is such a quick grower that I may take a different approach to that. Since I want to cut it before it seeds I may plant the buckwheat, let it flower, cut it and then plant something else into the buckwheat stubble. As all of us learn more and more what each cover will do, we can just think about the various characteristics of each cover and plant together the ones that fit our needs. You could also try all 4 together in a small area and see if the buckwheat flowers before the others get that tall. I plan to do something along those lines this year. Keep looking for opportunities and trying things. Sounds like to me you’re gonna to great! You are very welcome Mari Beth. Let me know if you have questions as you put the strategy to work.